SharePoint CrossTab Web Part – Coming Soon! This web part gives a CrossTab view of a SharePoint® list helping you to summarize and analyze data. We take a Sales list and first generate a CrossTab showing sales by product over time. 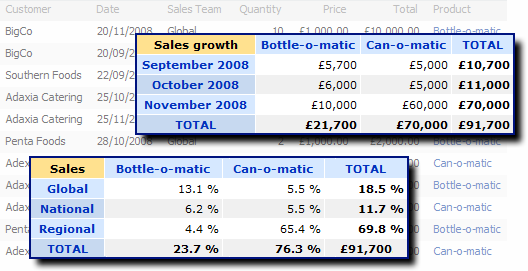 We can see a big increase in sales from £11,000 in October to £70,000 in November and most of that increase is due to sales of the “Can-o-matic” product. The next CrossTab shows the same data by Product/Sales Team expressed as a percentage of total sales. We can immediately see that the Regional sales team and the “Can-o-matic” are a winning combination generating 65.4% of revenue. Previously you would have to export this data to Excel or use MOSS Enterprise Excel Services to perform the same sort of analysis. Now using the CrossTab web part you can summarize and cross tabulate your data for easy analysis in all versions of SharePoint.